Can a band really improve exponentially? Cast proves that it may just be possible. I found it hard to believe that they could do much better than their last album, Endless Signs, but their latest really does improve upon it a good deal. Much of the neo-ish tendencies of earlier albums ("Allow Me" and the like) have been jettisoned in favor of a more full-bodied symphonic sound. As always, Alfonso Vidales' rich, classically-influenced keyboard work anchors the album through the four tracks, three of which are quite long and brimming over with moods and colors. Also included as a bonus track, a cover of the old Camel tune "Another Night," a rather loose interpretation of the original; only the vocal melody hasn't been tampered with, yet it's a very strong, not to mention imaginative, version. If their next album is better than this, my head may explode. 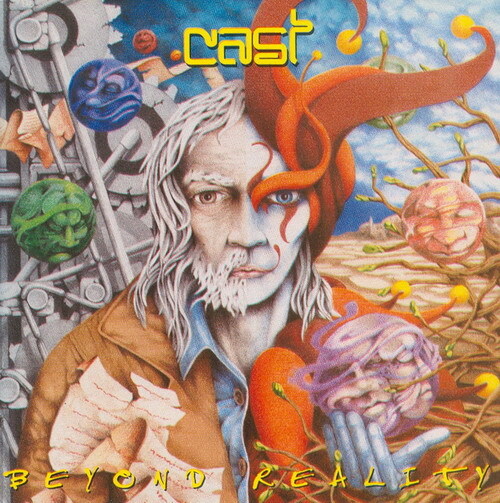 Cast has released some of the more interesting neo-progressive music in the past few years. In many ways, Beyond Reality is similar to last year's Endless Sings. The strong Trick of the Tail era Genesis overtones both compositionally and in guitar and keyboard sounds and styles, the fuzz guitar solo tone as the exclusive guitar timbre, the occasionally Steve Hogarth sounding vocals, the long instrumental sections, the harmony guitar and keyboard lines — all these traits are reminiscent of past Cast releases. However, Beyond Reality is no mere rehash or clone of the group's previous material. Many of the tunes have more complexity, diversity, and go in different directions than the band has shown before. Nearly all of the songs are primarily in either 5, 6, or 7 time signatures (especially 5) or some alternating combination thereof. It is pleasantly surprising to hear more meter changes in their music. The time changes help to keep the long sans-vocal passages flowing and interesting. Cast stretches out more tonally on this album than ever before too by periodically jumping into different modes (Lydian, etc. ), not simply sticking with the standard major and minor. Patrons of neo-prog should enjoy Cast. Beyond Reality is evidence that they are getting better with each album. If anything, Cast are at least one of the best when it comes to promoting and marketing their music. A hundred "progressive" bands could learn a lot from the way they do things as they've made quite a name for themselves, especially considering how unremarkable and thrown together their early albums are. Fortunately their talent now seems to be quickly catching up to their marketing drive. Cast is of the neo-progressive school roughly in the Pendragon / Marillion vein with an arsenal of metallic digital synth patches guaranteed to leave the analog synthesist cut to a million pieces. Talentwise theres no problem (although vocalists like these reproduce like amoebas), the drummer has lot of interesting riffs and fills oddly like Iconoclasta, and ignoring some of the tones the keys player is also a definite strong point. Musically there’s a lot to offer the symphoprog aficionado; lots of emotionally charged instrumental sections, nice guitar work, odd meters and all along the way you're thinking with a bit of tweaking these guys will be on their way to a masterpiece. Cast are proof that neo-prog doesn't have to be poppy and whiny — good music is good music. The Gak Omek • Bagudzinishinabe from Gak Omek on Vimeo.